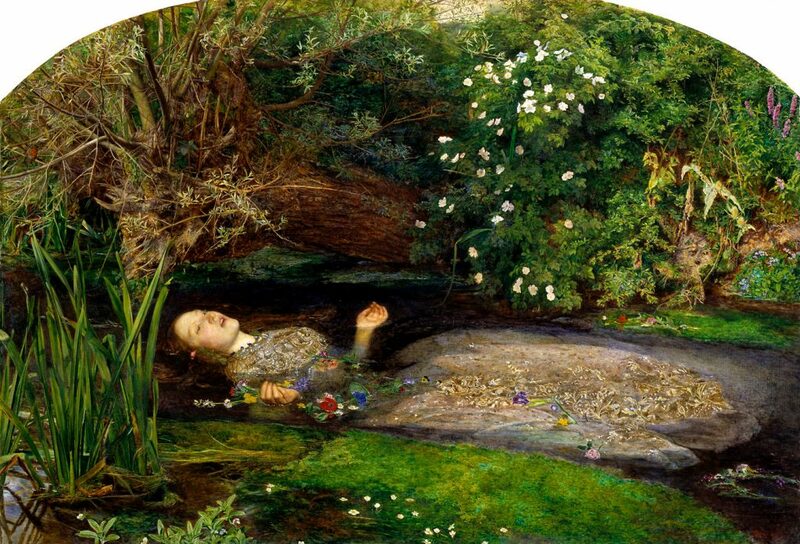 Ophelia may very well be Sir John Everett Millais’ most widely recognized picture. The story behind it is a famous one, model Elizabeth Siddal became quite ill after posing in a bathtub while wearing an antique gown, You can read more about her uncomfortable experience posing for the painting on the Ophelia page of my site LizzieSiddal.com. Millais set up a series of oil lamps under a bathtub in order to keep the water at a comfortable temperature. The lamps did not last, however, and Siddal posed for hours in the cold, never saying a word. This led to illness and the threat of a lawsuit from her father. 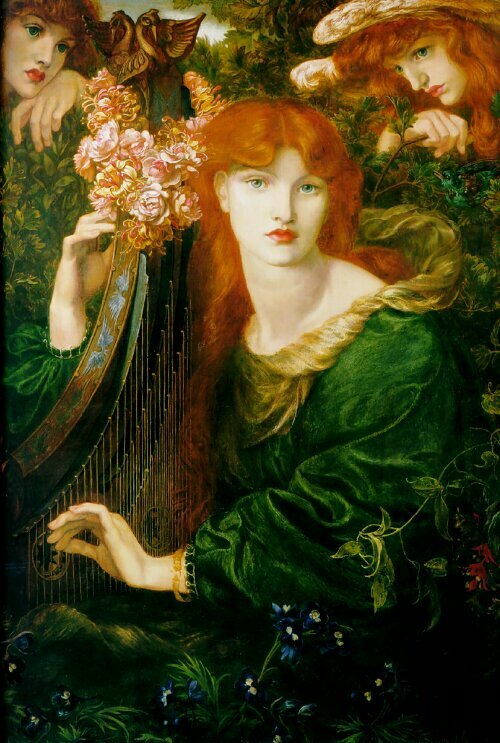 Siddal later married fellow Pre-Raphaelite artist Dante Gabriel Rossetti in 1860; she died of a laudanum overdose two years after their marriage. When John Everett Millais painted Ophelia he chose to depict her in the moments just before she drowns, a bold choice as most previous artists portrayed Ophelia before she enters the water. This isn’t the only striking aspect of his painting, however. In the midst of this picture of death, the plant life is rich and colorful. Each plant, whether in background or foreground, is given equal attention and no detail is spared. 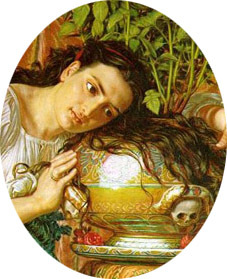 The botanical aspects of Ophelia are so important that Millais chose to paint the background prior to adding in the figure. And so Ophelia dies, alone with her flowers. Gertrude describes her as ‘mermaid like’ as if in an attempt to beautify the ugliness of death. 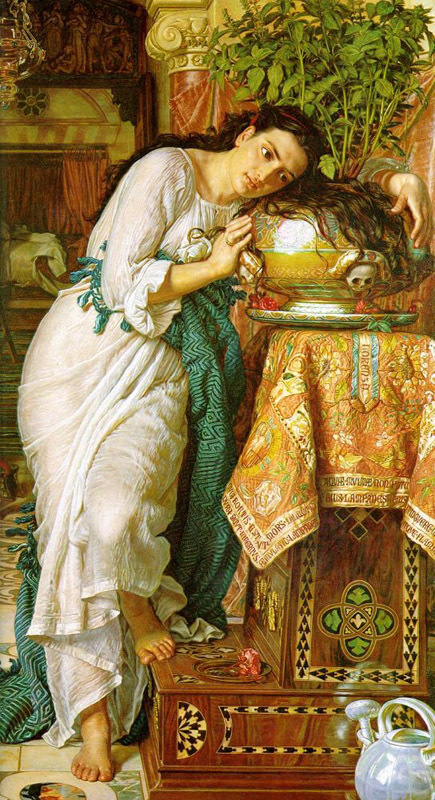 Isabella is an example of absorbing, haunting grief and is based on the narrative poem by John Keats. Isabella, the daughter of an affluent family, is in love with one of their servants, Lorenzo. Her brothers, having planned for Isabella to make a financially advantageous marriage, decide that swift action must be taken to stop Lorenzo and Isabella. They murder Lorenzo. His ghost later appears to Isabella and he leads her to his buried body. She digs him up, removes his head, and buries it in a pot of basil. She then cares for the pot of basil obsessively, pining away and consumed with despair. Hunt’s painting is brilliant, I think, in the way that he contrasts life and death. Her hair mingles with the leaves of the basil plant, a plant that is thriving due to her lover’s decomposing head. It’s incredibly macabre and sad. Sadder still is the fact that Hunt used his own wife, heavily pregnant at the time, as the model for Isabella. She died a few months later, leaving Hunt a widow with a baby to care for. One thing that draws me to Pre-Raphaelite art is this juxtaposition of something ugly with something beautiful. Grief, death, sorrow are shown through gorgeous imagery and jewel-like tones. The notion that Isabella has severed her deceased lover’s head in order to keep him close is something that we should find disturbing. Yet when looking at artistic depictions of Isabella, we are not repulsed. It is the haunting beauty and sadness we see and not the gruesome nature of her act. 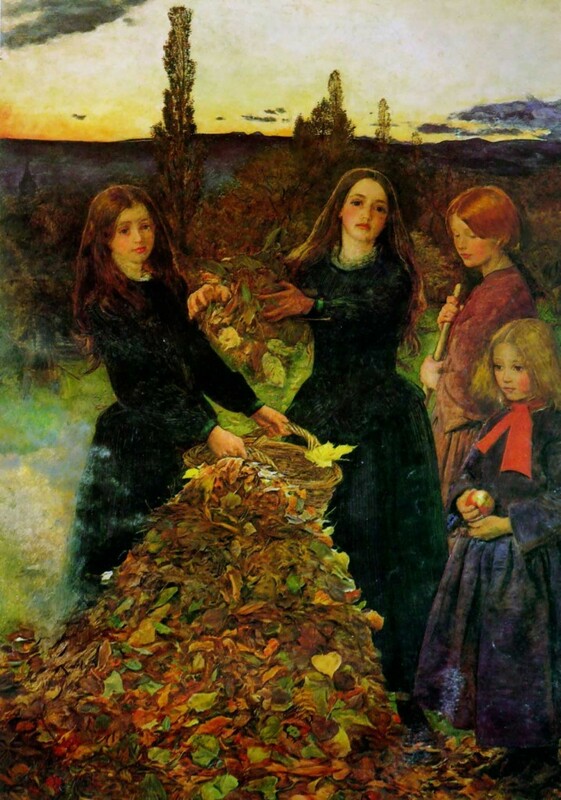 Autumn Leaves is an impressive example of a Pre-Raphaelite twilight. 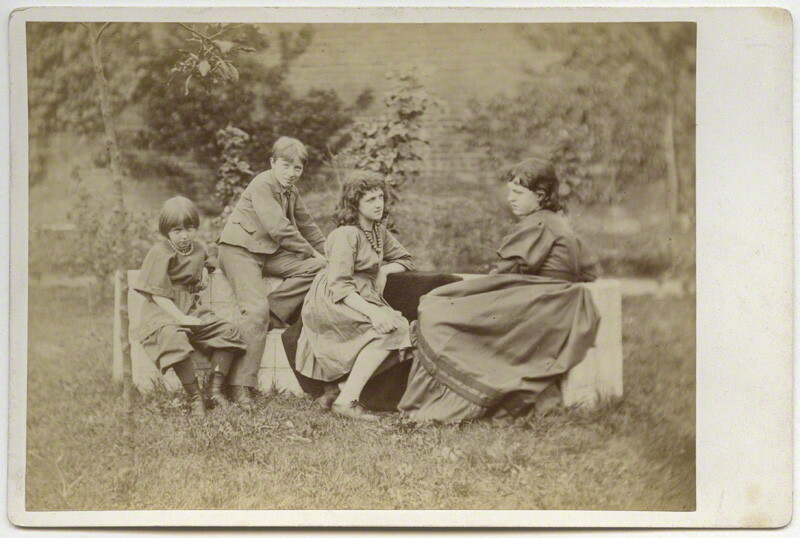 His models included his sisters-in-law Alice and Sophie Gray, a Miss Smythe of Methven, and an unidentified local girl, according to the artist’s son in The Life and Letters of Sir John Everett Millais. The pile of leaves is itself a mass of intricate detail, with each leaf painted with precision and in a variety of shades. Anyone who has ever plunged into a pile of leaves as a child should be able to appreciate this work. Robert Bateman was not a member of the Pre-Raphaelite Brotherhood, but he definitely emulated their style. 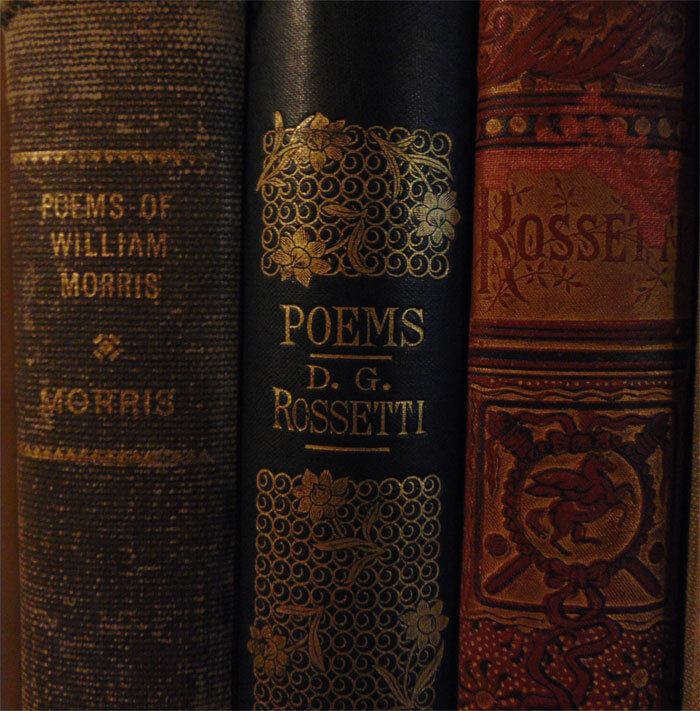 Nigel Daly recently wrote a fascinating book, The Lost Pre-Raphaelite: The Secret Life and Loves of Robert Bateman in 2014 after moving into and restoring Bateman’s former home. 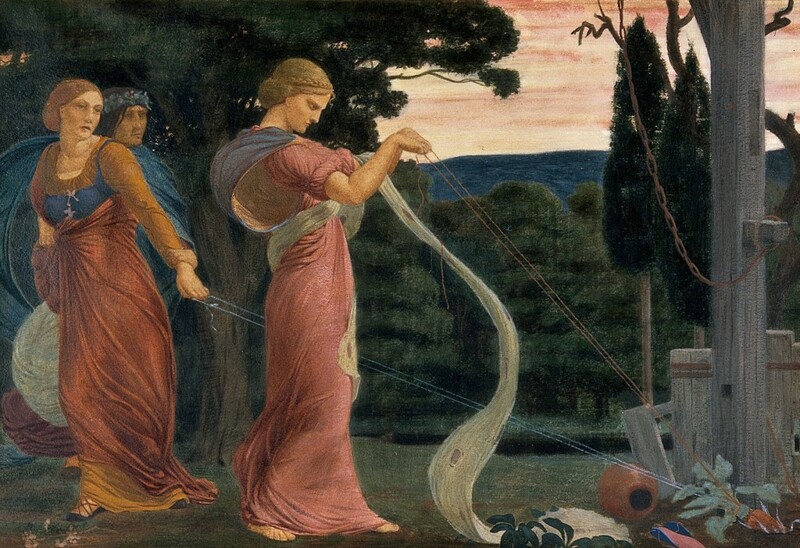 Three Women Plucking Mandrakes does not have the same level of botanical precision as many other Pre-Raphaelite works, but I love it because of its folkloric associations. Mandrake can be found in a wide variety of ancient literature from the Bible to magical lore. It could be used as an anaesthetic or to treat mania. Large quantities could induce madness. 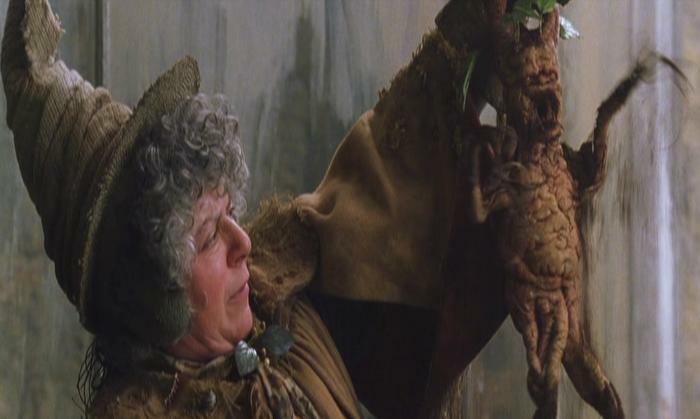 The mandrake’s appearance makes it a perfect plant for fairy tales and it is now recognized by an entire generation of Harry Potter fans. De Morgan’s Flora is inspired by both Botticelli’s Primavera and The Birth of Venus, works that are similar to each other while each being iconic in their own right. 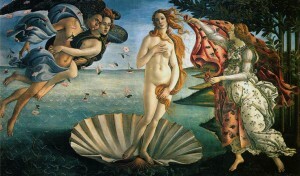 The stance in De Morgan’s Flora seems straight from Venus in her shell. Her gown is also similar to Flora’s gown in Primavera. 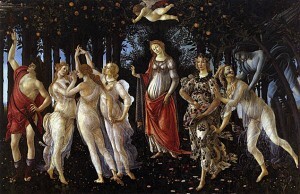 Flora may be an amalgam of Botticelli works, but she still seems original and fresh as a completely De Morgan piece. And unlike Botticelli’s works, De Morgan shows Flora without any figures surrounding her. Flora stands alone, allowing her to be the sole focus of the painting. De Morgan and her husband, the ceramicist William De Morgan, spent a great deal of time in Florence and there she developed a love for Italian art that shines through her works. 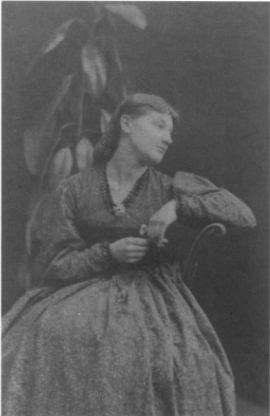 Her paintings are often compared to those of Sir Edward Burne-Jones, which is an apt comparison. They both excel at drapery and creating uniquely beautiful women. Art was in her blood, it seems. 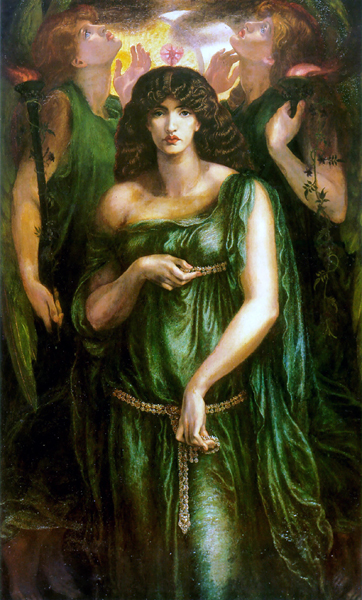 Her uncle was the artist John Roddam Spencer Stanhope, who also served as her teacher. 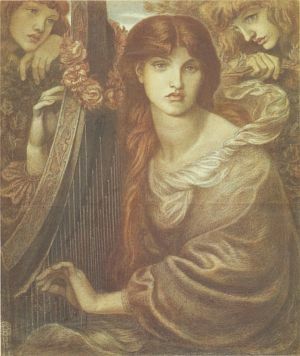 It is important to note that while she studied under Stanhope and is compared to Burne-Jones, De Morgan’s work is not derivative. She has a unique and definitive style. 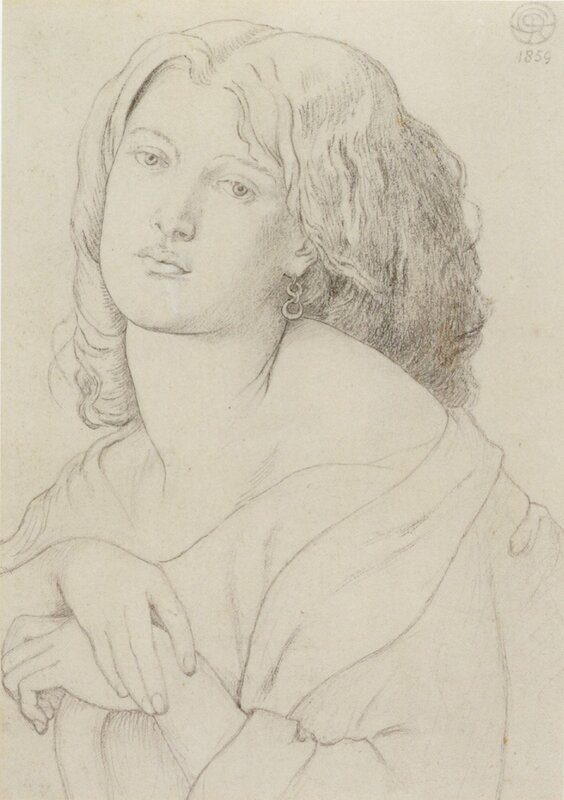 In Perdita by Frederick Sandys, I see the influence of both Botticelli and Dante Gabriel Rossetti. 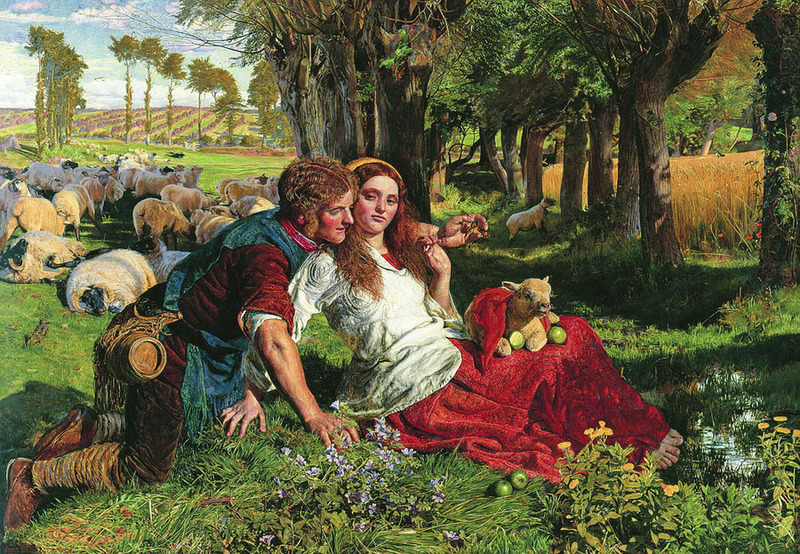 I’ve explored the painting more fully in the post Perdita, the lost girl, which also explains the Shakespearean roots of the character (as well as a certain famous Dalmatian). 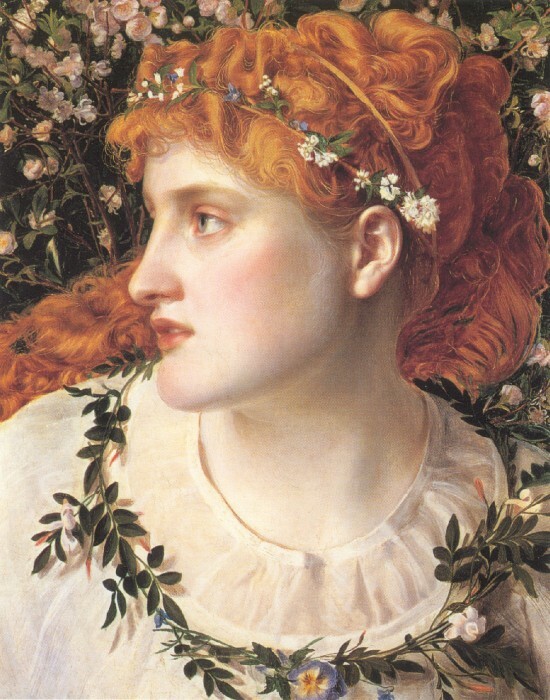 You can see in the garland around her head and neck and in the flowers behind her that Sandys put a great deal of effort into recreating the blossoms with fidelity.